Commissioned by the Philharmonie Luxembourg for the "Toy Piano World Summit"
Having composed a number of works for toy piano since 2005, I was commissioned by the Philharmonie Luxembourg to write a piece for the first Toy Piano World Summit on Dec 2nd, 2012. For every new piece involving the toy piano, I have set out to convey a different perspective. This time, however, I felt stuck for ideas and didn't want to repeat myself. In my despair, I began to dismantle a 25-key table-top piano. I opened the case and removed the set of tines that are responsible for producing the characteristic chime-like sounds of the instrument. Then I changed its position so that the hammers were not hitting the rods. Instead, the metal bar to which they are mounted was struck to create a metallic noise without any pitches. To make these subtle sounds more audible, I connected a contact microphone to the sound board and amplified the signal with a small loudspeaker. I was amazed at this new sound world. A new instrument was born: a gamelan-like percussion orchestra at my fingertips! Along with those metallic tones, this modified instrument contained even more sounds: a dry wooden attack on the lowest key (where the hammer directly hits the sound board) and also a few notes that still produce the usual toy piano tones. These new possibilities immediately kindled my imagination. By improvising with this setup, I discovered a variety of structural elements that attempted to connect to each other. Furthermore, the amplification became more and more important; not only to make the instrument louder, but also to achieve an aggressive expression more reminiscent of a thrash metal band than that of a children's instrument. In Miles to go, the four players are treated as a single unit, forming a single meta-instrument. They are not merely playing different voices, but contributing to a common sound that they are creating together. The dense and fast hammering at independent tempos creates haunting phasing effects that appear as an aural rendering of the well-known visual moiré patterns. These hectic and breathless movements evoke moments of stress and unrest but at a certain point, become transformed by the listener to the opposite: a quality of calmness. Finally, another transformation takes place when the percussive attacks are gradually replaced by soft and flowing sounds, which are achieved by stroking and scratching the soundboard with the handle of a percussion mallet. Miles to go is scored for four toy pianos which form a half circle on the stage. Each instrument is prepared and amplified with a contact microphone and an individual loudspeaker positioned next to the instrument. The four musicians play from the score and have to use stopwatches at some points. It is important to understand that the four players are not acting as individual voices but as parts of a common sound organism which is created by the sonic interferences of four related sound sources. Besides playing on the keyboard, the visible edge of the resonance board will be rubbed and stroked with the handle of a mallet beater (Studio 49: S7 Metallophone Beater). A contact microphone (AKG C411) is mounted on the resonance board of the toy piano and fed into a small mixer (recommended: Behringer Xenyx 302USB) from where the signal is sent to a small studio monitor (recommened: Fostex 6301 or Genelec 8010) positioned next to the instrument. In a smaller performance space the loudspeaker is placed beside the toy piano; in a larger room it should be mounted on a stand behind the player. At the end of the piece when all players are using their mallets, the sound can be gradually filtered with the high EQ of the mixer ad libitum. NB: It is absolutely necessary that all instruments are using exactly the same audio gear! 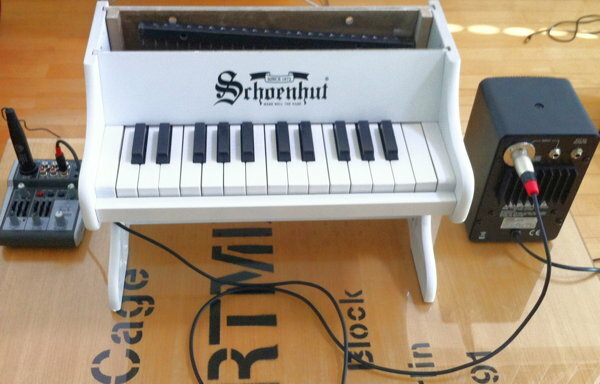 This piece requires 4 identical instruments, namely the Schoenhut tabletop piano 25 Key My First Piano II. They are prepared in a special way which transforms this keyboard instrument into a sort of exotic percussion with different types of sounds. Remove the upper lid from the tabletop toy piano. Remove the two screws that are holding the tone comb. Place it loosely into the slot and shift it to the right side of the piano. Lift the tone comb and position it on the horizontal wood strip. Secure it there with a small piece of foam rubber which is inserted between the right end of the metal bar and the resonance board. Now, the hammers of the upper octave are not hitting the metal rods but only the metal bar to which they are mounted. This will result in an unpitched, metallic sound. As the lowest key is hitting the resonance board, it will produce a wooden sound. 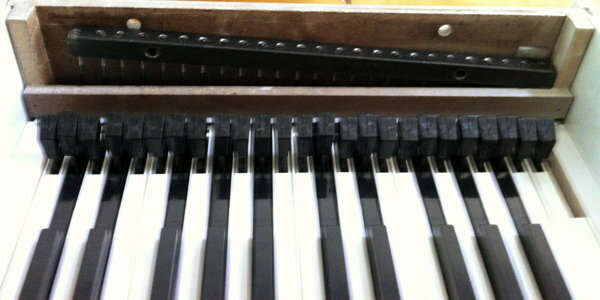 Note that the keys between low d and low f# are striking the rods - these are the only four keys which would produce the commonly known toy piano sounds. (NB: those tones are actually sounding a half tone lower due to the shifting of the tone comb to the right side.) Finally, the two highest key produce a variant of the the aforementioned metallic sound, however damped due to the rubber foam. The score of Miles to go can be downloaded for free. Please note that the music is protected by copyright. Published in: Fowl Feathered Review, Issue 4, Summer 2013, ed. by Virgil Kay (Halifax, Nova Scotia, Canada), p. 74-81. 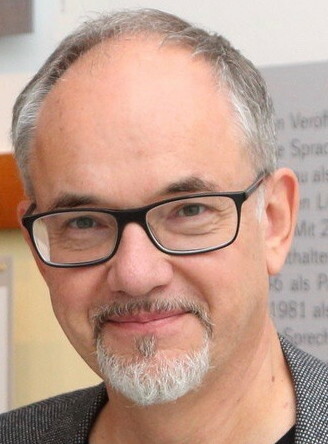 Chapter about Karlheinz Essl's compositions for toy piano. Doctoral dissertation, University of Florida, School of Music (Gainesville 2014), p. 39-41.